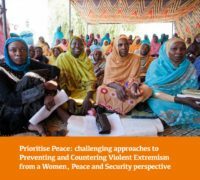 In January 2018 GAPS welcomed the UK Government’s latest, fourth National Action Plan (NAP) on Women, Peace and Security. Exactly six months on, GAPS is launching the GAPS NAP Six Month Check-In, our response to the 2018-2022 NAP. The response outlines GAPS’s reflections both on the NAP itself and its implementation, including the ongoing development of the UK Government’s Monitoring Evaluation and Learning (MEL) plan. GAPS remains encouraged by the process in developing the NAP, particularly the consultative nature of it. GAPS welcomes the cross-government approach, senior support and dedication of the team developing the NAP. GAPS believes that the omission of an MEL framework during drafting of the NAP was a missed opportunity, but is encouraged by discussions on its development since the launch and is looking forward to a robust NAP MEL framework. GAPS will continue to encourage the UK Government to increase funding for Women, Peace and Security and to support Women’s Rights Organisations, Women Human Rights Defenders, peacebuilders and Civil Society Organisations in Fragile and Conflict Affected States. GAPS will also continue to support the UK Government in strengthening its focus on the prevention pillar of Women, Peace and Security to move towards a comprehensive approach to conflict prevention.